In the end, it was actually America who lost last night at the MSNBC Commander-in-Chief forum, because one of these people will be our president in a few months, and the other two will no doubt live forever on our TVs. Hillary Clinton dug her own hole that much deeper, failing in front of a skeptical audience of mostly military veterans to push aside any of their skepticism, or ours. Given, once again, the chance to swing for the fences and put at least some of her bad decisions and scandals behind her, Clinton went for the safe grounder every time. Clinton came off as defensive and lawyerly. She said her vote for the Iraq War in 2003 was a mistake but would not say in front of the assembled vets the war itself was a mistake. She added a new excuse to her litany of email excuses — none of the information typed into her unclassified system had classification headings on it (like TOP SECRET), as if someone who was knowingly typing in such information would, sure, also document the felony by adding the header. She said hundreds of people at State violated classification rules with email, so presumably she was OK doing it, too. She stressed her long years of experience handling classified without mentioning that she said “I don’t know” 40 times to the FBI in answer to questions about how to handle classified information. She noted that State’s unclassified email system was hacked, while there was “no proof” hers was also broken into, a very lame defense when her communications should have been nearly 100% on a classified system to begin with. Trump then came out and did Trump, all Trump, hugely Trump, I can tell you, Trump, Trump, Trumpy Trumpster. He has a plan for ISIS, but won’t tell us what it is. He doesn’t like generals who lose. He thinks Putin is a helluva leader and Obama isn’t. He insulting female combat troops in remarks about sexual assault, and corrected a veteran with an incorrect figure about soldier suicides. Trump just kept Trumping and no one was very surprised. The major fail of the night was moderator Matt Lauer, to the point where #LaueringTheBar is trending on Twitter. Lauer tossed questions to the candidates and then took a nap as they answered, failing to follow-up or challenge most points. He was unable to control the length of answers given, and he allowed Clinton to violate her pledge to talk about herself and not use her answers to smear Trump. At one point Clinton actually stood in front of the seated Lauer, basically sending him off to bed while she handled the forum for awhile. Lauer also spent far too much time fishing for faux-controversy and ignoring the stated point of the forum, to explore how each candidate would act as commander-in-chief. And so we heard about the emails, we heard a lot of Trump’s man-boy love for Putin, and we had Lauer try and bait Trump into revealing something, anything, he’d heard in his classified briefings. 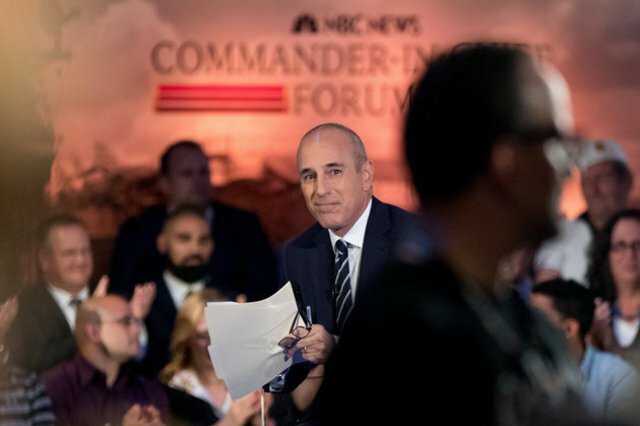 When a veteran in the audience asked Clinton to describe her plan to defeat Islamic State, Lauer interjected “to keep it brief” before the candidate even began her reply. Lauer and the Liar (pick your poison) should have asked each other questions about adultery. It’s the only subject they all have experience personally. American Exceptioalism = Matt Lauer, Veteran (of the Today show). Matt Lauer? Isn’t he on THE VIEW in drag on occasion? But, he’s very rich being a loyal servant of empire? He should have asked Clinton after she said she made a mistake and would do it differently regarding her email why she actually chose to go with a private serve. She’s given so many conflicting answers it would have been a hoot hearing another one. We know why she did it -to escape future scrutiny via FOIA – so Lauer should have demanded she give a clear explanation other than the ones which have been clearly debunked. CinC ME ! On the bridge of The Intrepid WW II carrier !! I Wonder WHY, “NBC hosted a presidential spectacle aboard a retired aircraft carrier on Wednesday night. It did not go (DOWN) well.” ? Spectacle, aproPOS of one of teh trifecta of disasters known to finish dying empires (together with internal corruption and external [illegals’] invasion) ! Bruce I hope you (and others posting here) are right about this vile empire tanking. I think the USA has been the most predatory and hypocritical of all the notable historical empires. Britain was pretty awful in India but becuase of our military might we have surpassed them with our monstrous bullying hubris. Atrocities are fairly common when one country decides they want to rule the world (Cue Tears for Fears) Asian pilots in WWII dropped bubonic plague infested fleas over their enemy’s territory. We’re way more sophisticated. We are now revising the Vietnam War to plug any possible breech in the thin wall of the Homeland’s conscience. We will continue to exploit to the max the 9/11 attack as the ultimate injury to an unsuspecting and impeccably moral nation while vaporizing innocent civilians in the Middle East. I will practice my citizenship obigation by voting for neither of the current candiates for POTUS. I have a right under this republic stressing democracy to vote NONE OF THE ABOVE! Lauer according to wikipedia makes $28million from his employer so we have to assume he is no longer his own man. LGBTFUIAMGETTINGPPPP”ED. Text me! Or Twirk. Stop the TPP. BDS. Have a nice day. I would say AMERICA lost last night, but how long has it been since this country had a winning record? We can’t win for losing: Clinton or Trump there can be no denial we are an EXCEPTIONALLY CORRUPT AS WELL AS THE DUMBEST COUNTRY ON THE PLANET. Trump does win the award for the dumbest statement of the night. Birdbrain Trump tweeted: 26,000 unreported sexual assaults in the military-only 238 convictions. What did these geniuses expect when they put men & women together? He does have the experience. Since they opted to do a “commander in chief” forum instead of a “foreign policy” forum, I assume no-one in charge of this crapfest is much interested in diplomacy, building partnerships with other nations, or peace initiatives, all of which would count as foreign policy. Guess I shouldn’t be surprised; Clinton herself has never been interested in those things and the public has been inured to everlasting war footing for decades. No – centuries. We’ve been “at war” with someone or another for 200 of our 240 year existence as a country. Matt Lauer may or may not have been a contributing member of the Clinton Global Initiative, by the by. He was listed as a “notable member” by the CGI, but they scrubbed the page before the forum took place. NBC now denies Lauer was ever a member. So either he was (and he and his employer are lying), or the Clintons were lying when they had him listed as one of their “prominent journalist members”. PVB: on your last post, I have a question or two which I am putting here since no-one goes back to previous articles. Under Clinton’s tenure at State, a lot of jobs formerly handled by the military and veterans were handed over to private contractors. If I recall correctly, even the once-banned (disgraced by overt war crimes in Iraq) Blackwater/Academi/Xi mercenary group was re-instated as employable by the State Dept., by Hillary Clinton. What effect did this (using mercenaries) have on veterans’ prospects of finding employment at the State Dept.? And what does it say about the State Dept.’s loyalty to our military that it preferred/prefers mercenaries to the military? Birds of feather flock together?